No matter how much of a planner you are, things sometimes fly straight out of nowhere and knock you off your game. Sometimes it is something you have to do, sometimes it is a situation you are in and sometimes it is something that is said... Last week, I feel like I was hit with all these and more. Thankfully we can put our hope and trust in the Lord and not in things or stuff, and we can realize that no matter if people say things that may sting, we are not here to please men, we are here to serve the King and make Him known in our lives. One way that I try to combat the hard days is spend more time together. As in, all hands on deck for something in the kitchen, or let's head to the garden for a bit, or maybe a board game together or something similar. Being together makes everything better in my opinion. 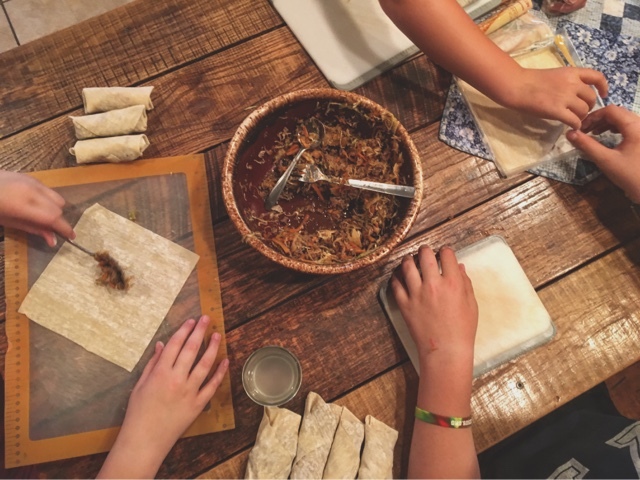 So last week when things were especially hard, I gathered everyone in the kitchen to make egg rolls. They were a huge hit with everyone and they are fairly simple to make. I don't really have a recipe, it was one of those meals where I just used things we had available. We used ground beef, cabbage, carrots, garlic, onions, mushrooms, soy sauce, brown sugar, and ginger. All things we had in the kitchen and I just mixed and tasted til it was right. Then I taught the kids the envelope fold for rolling the egg rolls and we pan fried them in some shallow oil. 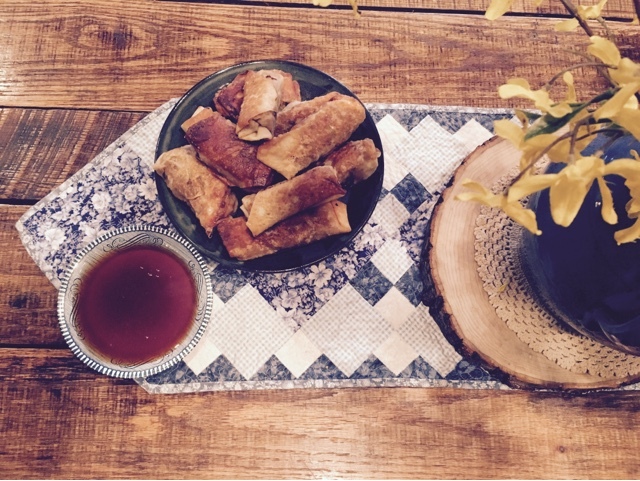 We made a sweet and sour dipping sauce to accompany the egg rolls. So friend, if you are like me and you are coming out of a hard week here are a few suggestions to help make this week better. Make sure you are in The Word. This is vital. Being in His Word is not just an occasional thing, it is a vital part of daily life. I heard a saying one time and I think it is absolutely appropriate. God's Word is like bread, it is intended for daily consumption. It is not cake which is intended for special occasions. Those may not be the exact words, but you get the idea. And be together. Spend time with your loved ones. Carve out moments to be together. It can be in the kitchen or garden, or reading together or going outside together, playing a game... Just be together. Time passes swiftly, ask me, I know! I'm getting used to a daughter being at work full time and away a lot of evenings... Make plenty of time for your family. Mom, it's important and don't let anyone make you feel differently. We need togetherness.